Darn that Eugene Cresto (again!). I am continually trying to keep up with the celebrities he has met. This last summer, he added Gapper, one of the Reds' mascots, to that always-growing list. Gapper has been on the scene since he was named via a contest at Redsfest in 2002. He is one of four mascots for the Reds. The others are Mr. Red (their first mascot), Rosie Red and Mr. Redlegs. Four mascots seem like a lot for one team, but I'm a mascot fan and okay with it. Obviously Eugene is okay with it, too. As I have written previously, I don't know how he does it, but Eugene seems to be everywhere. Of course, he also has said that about me. He's a good guy, often accompanied by his crew or his little girls. They are a fun bunch and we have crossed paths many times at different events. I don't recall seeing him with any mascots before this. Is he now expanding his focus to include these furry creatures? I'm going to keep an eye on him and see who he meets next. I'm sure it will be someone cool. If we ever truly teamed up, we could probably take over the world. 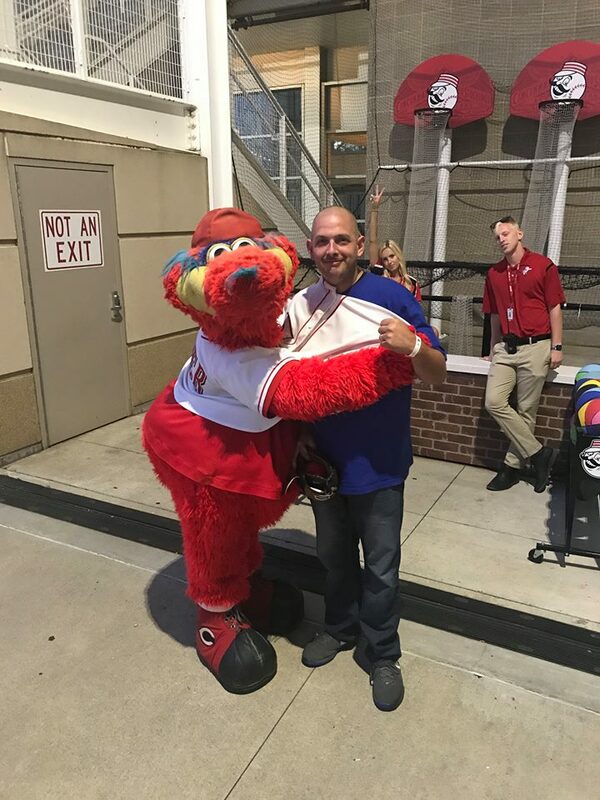 Gapper and Eugene Cresto in Cincinnati, OH-August 2017.